Great to upgrade, maintain and repair computer systems. Unique "Metrinch" bits offer metric and standard measurement sizes in one bit. Combination sizes include 3/16"-5mm, 1/4"-6mm, 5/16"-8mm, 11/32"-9mm and 3/8"-10mm. 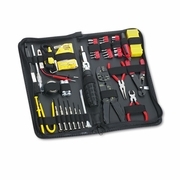 Kit also includes fully flexible ratchet driver (3-way latch), 6-pc. precision screwdriver kit, two AA batteries, wire stripper, brush, X-ACTO® knife, diagonal cutting pliers, chip extractor, needle nose pliers, 3-pronged parts retriever, electric voltage tester, flashlight, crimp and strip wire stripper, spare parts container with parts, surface cleaning wipes, cable ties, antistatic wrist band, T8/T10/T15/T20/T27 Torx® bits, adapter bit, #1 pozidriver bit, #4 and #6 slotted bits, S0/S1/S2/S3 square bits, #0 and #2 Phillips bits, insulated tape and vinyl zipper case.